PLA friend Chris Creamer of Sportslogos.net broke the great uniform story of the Tampa Bay Rays coming up with 1979 “faux pas” uniforms for their game against the Detroit Tigers on June 30. 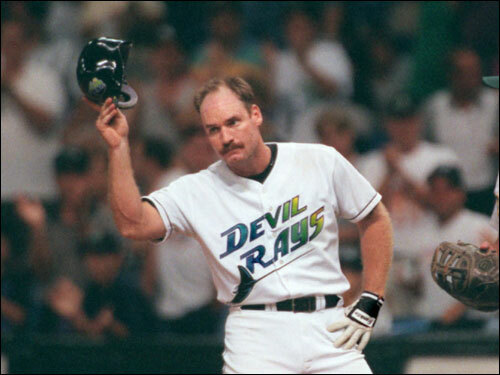 You see the Rays are going to don 1979 Rays uniforms, even though the Rays did not even exist in 1979, coming into existence as the Tampa Bay Devil Rays with these garish colors in 1998. Instead, they’ve been re-created to look as though they could have been worn in 1979, same with the hat which is described as having an alternate colored front panel and lower case lettering of a “t” and a “b.”. The jerseys will be power blue pullovers, with alternate sleeve trim, and a patch, maybe something along the lines of this look. Can’t wait to see the jerseys on the last day of the month at Tropicana Field. Authentic Store Buzz: When folks have been coming into the store lately, they’re drawn like magnets to the new Nike 2012 authentic NFL jerseys. Everyone wants to touch them and examine the many different fabrics used to make the jersey. Among the latest arrivals we mentioned last week, the Packers Clay Matthews, Miami's Reggie Bush, and the Lions Matthew Stafford (pictured above, left to right). A few years ago I’d have to pay someone for this ifnomration. I agree with anonymous that Power Ratings are silly, ulesns, they are accompanied by witty comments or in this case images. On a separate issue I’m a bit surprised that your blog has not really caught on. IMO, it is one on the most informative on any time and I suspect that those who write for Hardball Times or Baseball Prospectus are like myself, who keep the Rays as a guilty pleasure the team we secretly cheer for because of newer, smarter, administration. Indeed, in 2007, no lead, for Rays or opposition, was ever secure even in blowouts! Talk about an exciting team!